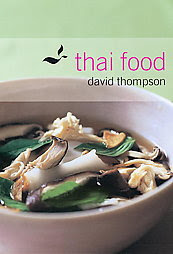 I have David Thompson’s Thai Food and I highly recommend it everyone because it is a fantastic cookbook. David Thompson is an Austrailan chef who has spent years in Thailand learning the culinary of Thai cuisine, he does everything in a traditional and authentic manner (he hates fusion food with a passion! ), roaming the streets and countryside, collecting knowledge and recipes from old women - recipes which are not written but passed down from generation to generation. Thompson also collects Thai memorial books, which are published when a person dies and include a wide selection of the deceased's favourite dishes. They offer one of the few written sources of classic recipes. The archive that Thompson has collected includes books dating back to the 19th century. His restaurant Nahm in London was the first Thai restaurant to ever gain a Michelin star and he has even been asked by the Thai government to set up restaurant in Bangkok to serve the very best thai cuisine. So the King of Thai food is an Aussie! Thai Food provides the most comprehensive account of Thai cooking that you will every find published in English. There are over 300 recipes that are very thorough and authentic. What I really appreciate about this book is that is provides a wealth of information which helps you to put everything about Thai cuisine into context including chapters on the role of food in Thai culture, a guide on ingredients used, the essentials of Thai cookery and sample menus which give you ideas for combining Thai dishes. Each recipe has an intro with a bit of background, a discussion of the main ingredients used (including possible alternatives for the hard to find ingredients) and also a description of what it should taste like. Everything is about taste, being able to describe what you taste is important, once you know what you are tasting, you are able to correct, to adjust flavours and to reach a balance. This cookbook is not just about showing you how to cook thai food, its about teaching you how to cook thai food. At the start of the chapter on salads, there is a thai salad dressing exercise which teaches you the dynamics of seasoning. The resulting salad dressing is amazing, full of flavour and has a great balance of hot, salty and sour. Using a pestle and mortar, pound 1 coriander root with a large pinch of salt and 3 garlic cloves. Pound 3 chillies into the paste and sniff: it should be rich with garlic, clean from the coriander root and sharp with chillies, but with no one fragrance overwhelming the others. Add and puree another 2 cloves of garlic. Notice the subtle change. To adjust the balance, puree another coriander root, a pinch of salt and another 3 scuds. The dressing will be more pungent now, but the balance should be restored. Now add 2 tablespoons of white sugar and the use the pestle to grind the granules. Add 2 tablespoons of lime juice and stir with the pestle until the sugar has completely dissolved. Taste the dressing. The sugar dominates, masking the garlic and coriander and even the chillies (momentarily). The chilli then shines through. Add a tablespoon of palm sugar and notice the mellowness that this sugar imparts, covering the heat once more. Add an extra 4 tablespoons of lime juice, not the dressing should be pleasingly tart. All the ingredients can begin to be tasted as the sweetness recedes. Add a further tablespoon of lime juice, and the dressing becomes sharp and clean and all the tastes are clear. Add another. Pour in 3 tablespoons of fish sauce, a tablespoon at a time, tasting after each addition. The dressing becomes more defined – tighter, as it were. Surprisingly, it even becomes sweeter. The dressing should be balanced: sour, salty, hot and sweet. To continue the exercise, add a further tablespoon of fish sauce and see how the dressing becomes surprisingly salty. This can be adjusted by adding roughly 2 tablespoons of sugar, one white and the other palm – each will result in a slightly different finish – add 1 more tablespoon of lime juice. The balance should be regained. The end of David Thompson’s thai salad dressing exercise! The aim of the exercise was to show you how each component in the dressing should be appreciated and how they can be manipulated to strike a balance. Sweetness gives the dressing body and depth; however, it should never be the dominant seasoning. Saltiness makes flavours more discernable, drawing out especially – yet surprisingly – the sweetness of other ingredients. Sourness cleans, highlighting the other tastes and ingredients. Heat gives pungency to the dressing, but also helps to clean the other seasonings and flavours, preventing them becoming a clutter of tastes. It also makes the palate more sensitive to texture. Thai Food has a number salad recipes which I skimmed through and then came up with my own thai salad, drawing elements from different recipes. I wanted my thai salad to have a depth and complexity of flavour, and lots of different tastes and textures that balanced well together. I started off by putting a layer of thinly sliced cucumber on a plate (I used a peeler to achieve a ribbon effect). Then I put pieces of red grapefruit on top. In a bowl I mixed together some prawns (which I had poached), bean sprouts, finely sliced shallots, some mint, coriander and thai basil leaves. Then I added in a few tablespoons of the thai salad dressing I had made from going through the salad dressing exercise and tossed everything together to combine. Then I piled the prawn mixture on top of the grapefruit, adding a little more salad dressing on top and then sprinkled on some fresh grated coconut. In assembling this salad, I put some thought into the presentation and how it might contribute to the taste of the dish, drawing from my experiences at the Amuse masterclass. Everything was deliberately piled up high, on top of each other. You delve into the salad from the top, digging into the prawns and veges (with crunchy textures provided by the bean sprouts and bursts of flavours from the herbs) with a pungent and flavoursome salad dressing, countered by the rich and cooling freshly grated coconut. Then you hit into bittersweetness with the grapefruit (which is acidic and provides a little relief from the heat of the chillies in the salad dressing). Lastly, you get a pleasing and crisp coolness from the cucumber at the bottom of the salad. The salad tasted awesome, it was everything that I wanted it to be, and I also have to say that prawns and grapefruit so really well together. “the ideal of a Thai salad is simplicity, but it is also about a balancing of ingredients”.